Set against the backdrop of the breathtaking Pyrenees, the town of Sort is an ideal location for an activity holiday. 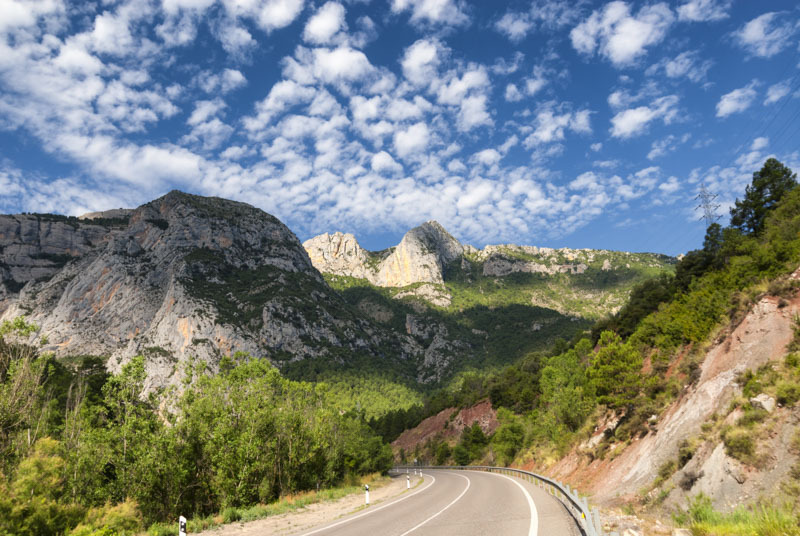 Explore the beautiful surroundings of Aigues Tortes National Park, whitewater raft and kayak along rivers and have the option to abseil down gorges and try our hand at abseiling and off road mountain biking. All equipment is provided and no previous experience is necessary. Sort - Activity centre of the Spanish Pryrenees with bars and cafes to watch the world go by and several excellent restaurants showcasing some of the best of Catalonia's proud culinary traditions. Arrive Barcelona airport, transfer 3.5 hours to Sort and check-in at hotel. This charming mountain village close to the Noguera River is the centre for watersports in the Pyrenees. The name means 'luck' in Catalan. The minimum suggested age for this activity is 8 years old. There are no included activities on this day. For those than want to try abseiling, there is the opportunity to drive 30 minutes north to the beautifully set Guingueta reservoir, one of the dammed lakes of the Noguera river. There are excellent views of the Pyrenees with the backdrop of mountains all around. After changing into our wetsuits and harnesses we'll spend the morning abseiling, jumping and sliding down the Estaron Canyon. We'll be back at the hotel at lunch time and then the afternoon is free for more optional activities or relaxing by the pool or use the hotel spa; all guests 14 years and over will receive a complimentary two day spa pass to use during their stay with access from 1600 to 2100 daily except Mondays. Children from 14 to 17 can access the spa between 1600 and 1700 hrs Tuesday to Friday, between 1100 and 1500 on Saturdays and 1600 to 2200 on Sundays. For those looking to explore the village of Sort, there is plenty to explore in this old capital of the area with remains of the castle dating back to the 11th century still overlook the village. A great location with beautiful surroundings and the backdrop of the Pyrenees, the town also boasts several pleasant bars and cafes where one can sit on the terrace and watch life pass by. In the evening a dinner out of the village can be organized in one of the delightful restaurants tucked away in small mountain villages not to far from Sort. The town is known for its fine choice of restaurants. Looks can sometimes be deceiving, some of the best eateries in town may not look appealing at first glance but it's not hard to find outstanding traditional Catalonian food at great prices. Typical set menu start at €25 per person with six course taster menus around €40 including wine. There are also several family friendly options including a great pizzeria. 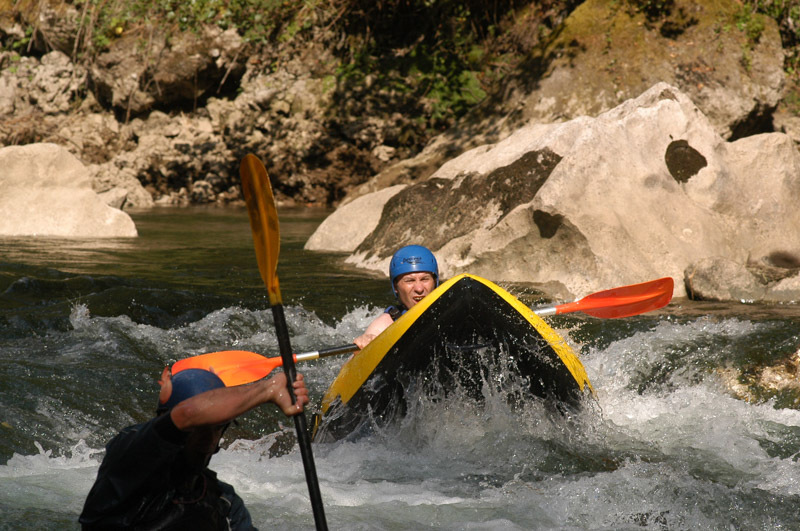 Experience the thrill of whitewater rafting. Driving to our activity base right next to the river, we don our wet suits and lifejacket to explore this exciting river on our rafts along a 14 km stretch of the river. Pass through some exhilarating rapids including the famous 'washing machine' rapid which will throw your raft onwards as your travel down the steep body of water and we are sure you will yell with triumph once through this rollercoaster of a rapid. The river Noguera is unique as there is a high enough water level all year round for water sports. For those opting for a full day of rafting will head back to the river after lunch, returning to our hotel around 5pm. By today you will hopefully know which activities you liked most and there are plenty of possibilities for a very active day, perhaps exploring 'hell's' canyon which involves abseiling 20 meters into a cave, horse riding or mountain biking. Another option involves a more challenging way of floating down the river in an activity called hydrospeed where you hang on to a little board following the current through rapids and calmer sections of the river. This morning is left free for relaxing or filling in with further optional activities that your tour leader can help you organise. This afternoon we transfer to Geri de la Sal village where we get changed into our wet suits and spend the afternoon kayaking down the Noguera River through some exciting rapids and stunning canyons. These kayaks are often referred to as 'open kayaks' (inflatable, very stable mini-rafts). This area is one of the last habitats of the 'quebrantahuesos' vulture (or bearded vulture) which is close to extinction in Europe - with a bit of luck we can see one. Today you can rest at the pool or on the banks of the river. Alternatively you may want to go for a walk in the surrounding area or ask the Tour Leader to organize another activity for you. There are a wide range of possibilities; recommended is the exhilarating mountain bike ride through the Montgarri valley or perhaps you may wish to spend the afternoon horse riding. After breakfast we drive to Barcelona Airport where the tour ends. If you are staying on you may wish to explore this fascinating city with its many attractions such as 'La Boqueria' food market, Las Ramblas boulevard lined with bars and restaurants and not to mention the many incredible architectural works of Antoni Gaudi. If you flight is later than the dropping off time at Barcelona airport, there is the opportunity to travel into Barcelona by bus and bags can be stored at the airports left luggage for around Euro 10 per piece of luggage. These prices all include transport costs and are based on a minimum of 4 participants per activity. If there are less than 4 people a small group supplement may apply. Child rates, where applicable apply to children 11 and under. Please note a half day of rafting is included on day 4, should you wish to book a further full day of white water rafting this can be arranged locally. Waterproofs for showers are also recommended as the weather can change with little notice as in all mountainous areas. Lightweight cotton clothing is advised from June to September with a fleece for higher walks. Walking or trail boots are essential, plus comfortable trainers. Sandals are useful in summer. An extra pair of old trainers is recommended for canyoning. During the summer months we recommend you bring a sunhat and sunscreen as temperatures can be high. Water bottle and torch are essential. For this we suggest £15 per family member. The hotel is situated in the small town of Sort which is next to the Noguera Pallaresa River in the Lleida Pyrenees. The hotel offers a range of facilities including; a bar, restaurant, lounge, children's play room, indoor and outdoor swimming pool, gym, tennis courts, sun terrace and a large garden area. The en-suite bedrooms also offer a hairdryer, free Wi-fi, satellite TV and have views over the swimming pool, garden or local town. The hotel also features a spa; all guests 14 years and over will receive a complimentary two day spa pass to use during their stay with access from 1600 to 2100 daily except Mondays. Children from 14 to 17 can access the spa between 1600 and 1700 hrs Tuesday to Friday, between 1100 and 1500 on Saturdays and 1600 to 2200 on Sundays. Triple rooms are usually in the form of an apartment which is located at the hotel with direct access to the pool and garden area. The apartments have a fully equipped kitchenette, bathroom, dining room and TV. They have a double bedroom with either a twin or double bed and a sofa bed in the main room that is ideal for teenagers. Apartments are cleaned twice per week and once for a change of towels and bed sheets. Please note that these rooms will be allocated upon arrival and families will be housed in either the apartments or the hotel to ensure they are close together. Adventure capital in the Spanish Pyrenees: Based at a family run hotel in the Catalonian town of Sort, this week long activity week offers the chance to try a number of active pursuits including white water rafting, kayaking, hiking, canyoning, abseiling and mountain biking all easily accessible from the comfortable Pessets Hotel & Spa. Be as active as you want with the flexibility to pick and choose what activities you want to try each day. The town of Sort is perfectly located to offer the widest choice of exhilarating adventure activities. Located four hours away from the coast, north east of Barcelona, our base offers the chance to travel to Spain in the summer holidays yet still escape the worst of the crowds. It’s possible to extend your flights to incorporate a beach holiday at either end of the trip should you wish. Sort is also known for its fine choice of restaurants. Looks can sometimes be deceiving, some of the best eateries in town may not look appealing at first glance but it’s not hard to find outstanding traditional Catalonian food at great prices. Typical set menu start at €25 per person with six course taster menus around €40 including wine. There are also several family friendly options including a great pizzeria. Triple Rooms: This trip allows the option for triple rooms to be included within the booking on all nights; it’s also possible to request a one or two bedroom apartment for a supplement. If you would like these options, please ask our Sales team for further information. Average Age: As a guide we have identified the actual average age of the children who have travelled on this trip over the last 5 years, to help you decide whether it's the right one for your family. The average age on this trip is 13 years old, this trip is suitable for children of all ages and no previous experience is necessary to participate in the activities. This holiday is perfect for active families who enjoy the outdoors all set against the stunning backdrop of the Pyrenees. 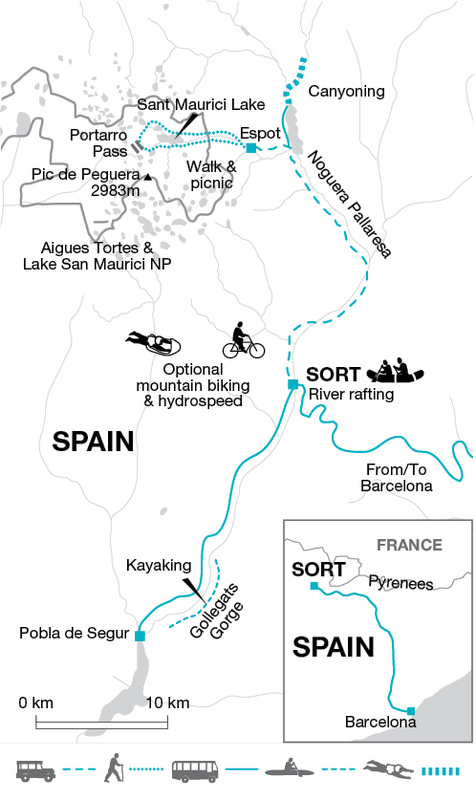 Sort is the Pyrenees' premier water-based activity centre - a true mecca for lovers of white-water rafting, canyoning, kayaking and hydrospeed. Our riverside hotel has been specifically chosen to offer a range of facilities including tennis courts, two swimming pools and a gym plus it is located close to the Aigues Tortes NP, the region's finest National Park with numerous walking trails. Furthermore, the town of Sort is an ideal location to discover the traditional local culture of the area and last but not least is blessed with a beautifual micro climate, allowing an average of 300 days of sunshine per year.